I’m a firm believer that resolutions should not be a once a year decision. That being said, I am declaring my latest resolution to update this blog one of many resolutions I will make in 2015. To begin my blog updates, I’m making the posts more “Alana-like” and adding structure. Each post will include something that has inspired me and an update on my writing. Last night, my husband and I went to a New Year’s Eve dinner at Coqueta in downtown San Francisco. The chef (@chefchiarello) used four Spanish artists (Miro, Dali, Picasso, and Gaudi) as his inspiration and the theme for the night. Two particular dishes stood out to me. 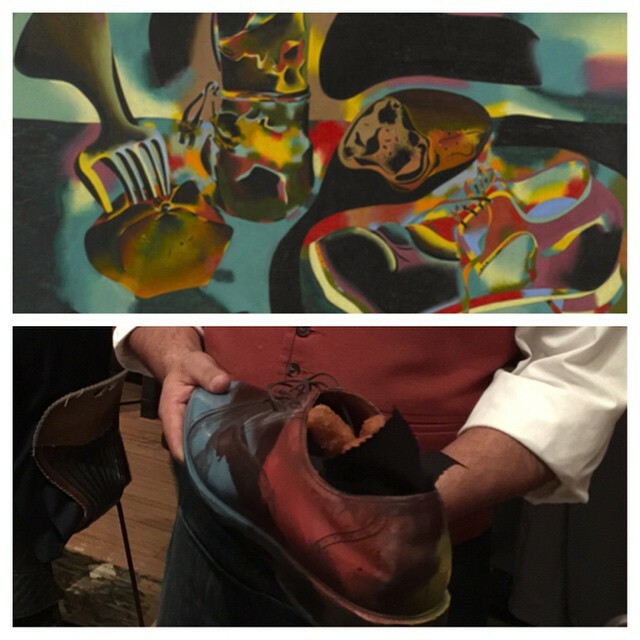 One was an ironic, yet delicious, interpretation of Miro’s Still Life with Old Shoe oil painting. Picture below includes the painting and a server passing out chicken croquette’s from an old shoe. The second was an translation of a quote by quirky Salvador Dali (the Spanish chef emphasized the accent on the “i”). In Dali’s opinion, purgatory included eating sea urchin and ham. The chef brought the vision to life with dry ice, and I’ll admit, purgatory was tasty. Check out my video on instagram: http://instagram.com/p/xTWnczEOuJ/?modal=true. I consider myself superstitious (can’t fight the jinx theory! ), and I thought it was a nod from the universe that Dali was one of the artists honored at last night’s dinner. Dali is a teacher at Vita Post Mortem Academy in my next young adult, fantasy series about a girl who goes to school taught by spirits. Dali’s character is bizarre and eccentric. His classroom is a collection of clocks stopped at exactly 4:17, the time he died. As a school assignment, he asks the students to decorate their own urn while he has colorful conversations with his old friend / foe Picasso. I have been brainstorming ideas for a book trailer as well. It would include creepy scenes driving through dark woods, doors creaking, and curtains blowing ominously. I was hoping my cousin Jane would record an unplugged version of Eminem and Rihanna’s song, “The Monster,” and my cousin Melanie would narrate. Fingers crossed they are on board. And my editor is reading through my draft. I’m hoping to publish the book in the Spring!